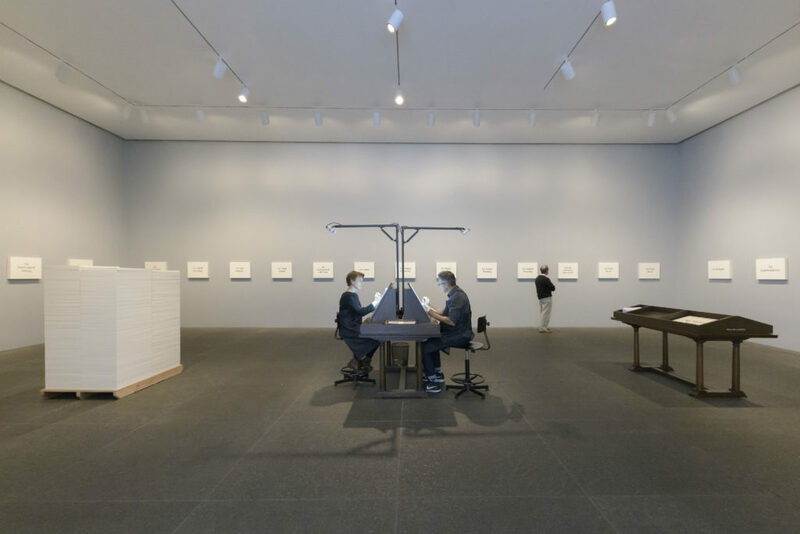 The 2018 Carnegie International, which closed the 25th of March with a flurry of events and performances, offered the peace of mind, wonder, magic, and purity lacking in today’s politically and socially turbulent times. Curator Ingrid Schaffner, assisted by Ashley McNelis and Liz Park, has put together a well-executed and -curated International that simply invites visitors to “experience museum joy,” while “exploring what it means to be international today.”1 Many other similar exhibitions have been more explicitly social-political: the dense, Marxist 56th Venice Biennial curated by the tragically late Okwui Enwezor; Cleveland’s inaugural FRONT Triennial, curated by Michelle Grabner, which took place throughout the city and pointed to the Rust Belt’s changing landscape; the 2017 Whitney Biennial with its infamous Dana Schutz scandal or the upcoming edition, which has already created political impact before opening. In contrast, the International and its call for “museum joy” reads as a bit utopian if not detached. The pendulum always swings the other way, but this year’s Carnegie International may have pushed it toward Matisse’s “armchair” theory of art a little too quickly. After an intense period of research with travel to twenty-three countries across five continents, Schaffner and her curatorial advisors pared down thirty-two artists and artist collaboratives. Giving ample space to each participant, the International feels like beautifully-woven together solo exhibitions rather than a philosophical curatorial statement. However, there are few truly remarkable new discoveries, with most artists already familiar to a Western contemporary art audience. Installation view. Lynette Yiadom-Boakye, 2018, 57th Carnegie International. Photo: Bryan Conley. Courtesy the artist, Jack Shainman Gallery, New York, and Corvi-Mora, London. The group exhibition in the main galleries flows from luscious, velvety stitched paintings and a wall-long blue-tiled ceramic installation by Sarah Crowner, formally in conversation with Ulrike Müller’s Wraps and Rugs; a sculpture and two photographic paintings by the always-strong Huma Bhabha; oil on linen paintings by Lynette Yiadom-Boakye; American artist Mel Bochner’s cheeky words on black velvet; Art Labor’s collaborative Art Labor Hammock Cafe provides an art-lounge for visitors to sit and enjoy daily coffee service that also nods to the labor of the coffee trade; before entering Alex Da Corte’s room-sized neon installation of a suburban house with video playing inside. 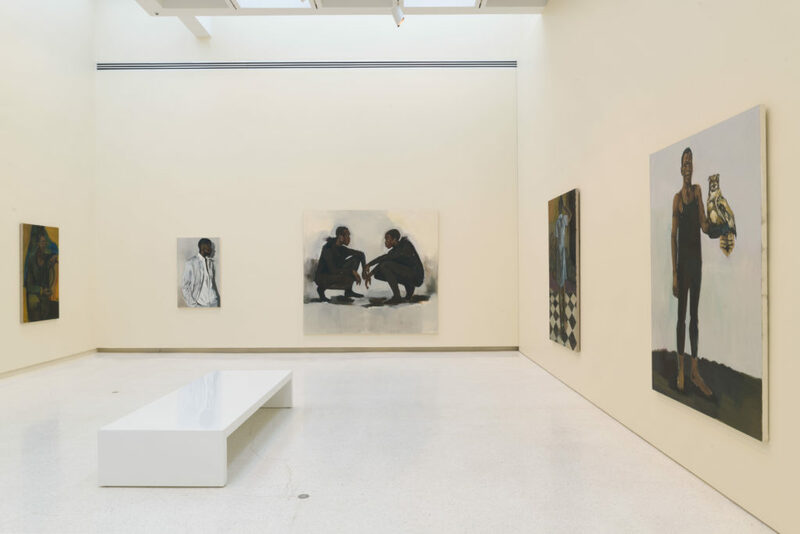 The airy installation Lynette Yiadom-Boakye’s thirteen new paintings captures this beautiful International at its best. Each of her poetic paintings is a dream in itself, as well as part of a larger conversation between paintings. A moving male figure holds an owl on one raised arm; a group of male figures shirtless and slouched; a single figure smoking a cigarette, fog across the painting; two figures crouched down and facing each other, their draped arms slightly grazing; a male in a gray suit; two figures crouched down gently conversing—each of these of imagined black figures are at the service of her masterly, washy, and ephemeral brush strokes. Yiadom-Boakye’s work is widely recognized, but this ‘solo’ exhibition inspires fresh vitality. On the other hand, as the International dedicated so much space to heavyweight Bochner’s clever language paintings, it feels a missed opportunity to feature a lesser-known artist. In Lenka Clayton and Jon Rubin’s calligraphy/painting studio, entitled Fruit and Other Things, two performers / painters wear smocks and sit behind classical easels, carefully painting a single title from the 10,632 artworks rejected by the International during its early years as an open call painting exhibition. Each work hangs on the gallery walls until a visitor takes it home. This precise and particular project is research-driven, beautifully-installed, and fascinating, but provides only temporary satiety. The Carnegie’s lingering superficiality was captured in earlier reviews by Evan Moffett or Andrew Russeth’s remark as “buoyant, beautiful, and strangely conservative.”2 Another Pittsburgh-based artist, the 92-year old sculptor Thaddeus Mosley, presents a gathering of physically impressive and formally beautiful, larger than life-size, carved wooden sculptures. Chicago’s own master Kerry James Marshall show his latest iteration of Rythm Mastr comic series, which he premiered at the 1999/2000 International. Another Chicago “home-town hero” appearance is the gallerists John Corbett and Jim Dempsey, who become collaborators in Josiah McEleheny’s presentation. Of course, this International does include newer discoveries: a video installations by Kenyan artist Mimi Cherono Ng’ok; found-furniture assemblage sculptures of young up-and-comer Jessi Reaves; Yuji Agematsu; and corporeal ceramics by Irish artist Lucy Skaer, poignantly incorporating a pieta in the Carnegie’s permanent collection. Installation view. Koyo Kouoh, Dig Where You Stand, 2018, 57th Carnegie International. Photo: Bryan Conley. Courtesy the artist. Breaking up the ‘wander with curiosity and amazement’ pace, and a personal highlight, is Dig Where You Stand, an “exhibition- within-an-exhibition” arranged by Cameroonian, Dakar-based curator Koyo Kouoh. Working with local students, Kuouh excavated the Carnegie Museum art and natural history collections to compile a visual investigation of coloniality.3 Dig Where You Stand abandons a linear or chronological representation of the museum collection, instead juxtaposing contemporary and historic objects across fine art, design, or natural history classifications. A silver tea machine from 1810 mirrors a wooden African sculpture; a silhouette cut-out portrait of The Honorable John W. Blessing holding a whip becomes eerie when juxtaposed with Kara Walker’s work; Isamu Noguchi’s curvilinear sculpture brings out formal surprises in a work by Thomas Hart Benton; and endless other visual surprises await as you wander through the space. The resulting visual web of connections not only provides a more global, democratic shuffle but also a critical questioning of the way museums manifest their elite founders’ motivations. Postcommodity, an artist collaborative between Cristóbal Martínez, Kade L. Twist, and rotating members with a shared Indigenous lens, occupies the impressive Hall of Sculpture’s central atrium. 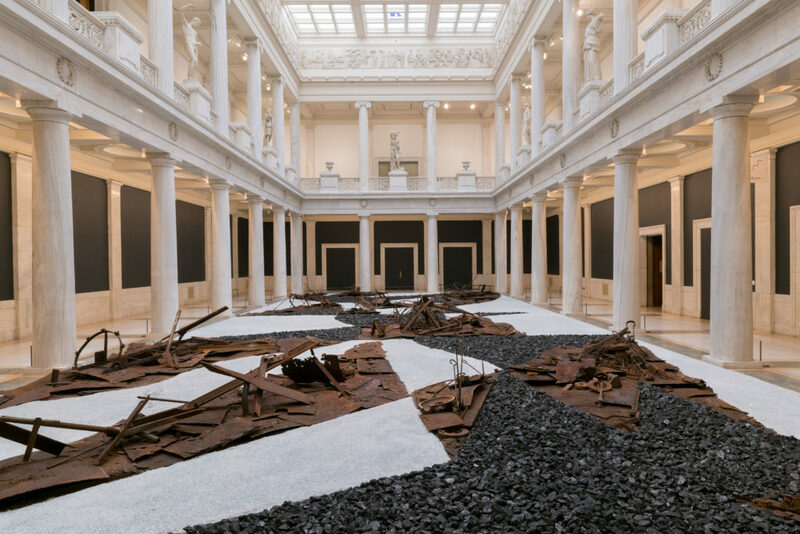 From above, the massive installation entitled From Smoke and Tangled Waters We Carried Fire Home, resembles a lyrical black, white, and rust abstract painting. From the ground it is a stretching landscape of re-purposed rusted steel, crushed glass, and coal, all sourced from a defunct nearby furnace. The Rust Belt region’s declining industries have yielded this material—the very same industries which brought thousands of workers to Pennsylvania in the early 20th century to stoke the fire of Andrew Carnegie’s incredible wealth. Laid down in a manner inspired by Navajo sand painting, From Smoke is brought to life by jazz musical performers who play an improvisational score embedded within the abstractions. Installation view. Postcommodity, From Smoke and Tangled Waters We Carried Fire Home, 2018, 57th Carnegie International. Photo: Bryan Conley. Courtesy the artists. Kerry James Marshall often says, “if you want to master the game, you have to play by the rules of the game.” The game truly has changed since 1985, and this year’s roster of art stars certainly cannot be criticized for lack of diversity. However, the visibility and attention to artists of color, women, and non-Western artists has been hard-fought through years of criticality, engagement, and pushing the envelope. Somehow, it feels a little decadent to sit back in that armchair and savor museum joy. This International provides a luxurious and beautiful breather, but leaves more work to be done. 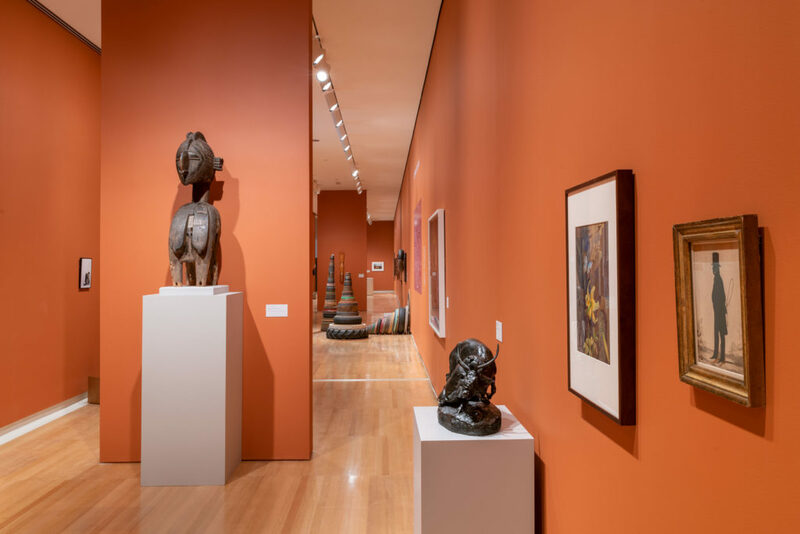 The 57th Carnegie International ran at the Carnegie Museum of Art from October 12, 2018 until March 25, 2019. 1 “Carnegie International, 57th Edition, 2018 – Carnegie Museum of Art.” Carnegie Museum of Art. Accessed March 24, 2019. https://cmoa.org/exhibition/carnegie-international-2018/. April 1, 2019 | Filed under Art Seen: National and tagged with 2018 Carnegie International, Anastasia Karpova Tinari, The Seen.